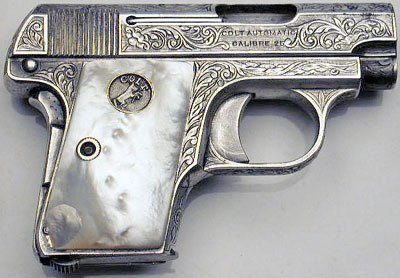 Silver plating was the rarest of the special finishes for the Model N. Of approximately 410,000 guns produced, there were only 64 factory silver plated .25s, only a handful of which were also factory engraved. 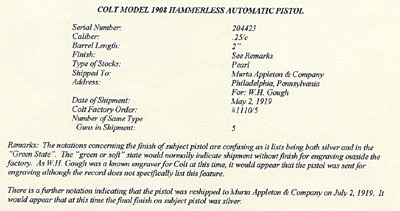 Colt Model 1908 Vest Pocket Model Serial Number 204423 - One of five guns shipped to Murta Appleton, Philadelphia, PA for William H. Gough on May 21, 1919, returned to Colt and reshipped to Murta Appleton on July 2, 1919. 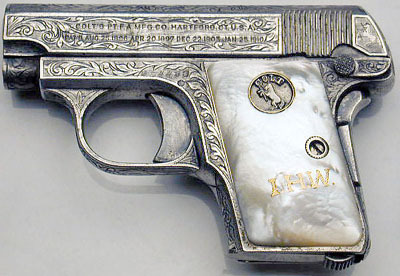 The other four pistols were also silver plated and fitted with mother of pearl grips. 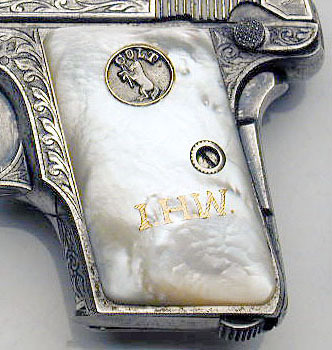 This pistol has full factory "C" coverage, is silver plated and is fitted with gold inlaid monogrammed mother of pearl grips with recessed medallions. The work was processed on Colt factory order number 1110/5. Remarks: The notations concerning finish of subject pistol are confusing as it lists being both silver and in the "Green State". The "green or soft" state would normally indicate shipment without finish for engraving outside the factory. As W.H. Gough was a known engraver for Colt at this time, it would appear that the pistol was sent for engraving although the record does not specifically list this feature. There is a further notation indicating that the pistol was reshipped to Murta Appleton & Company on July 2, 1919. It would appear that at this time the final finish on subject pistol was silver. One distinctive style used by Gough is the presence of a five pointed star on the rear of the frame. This is also present on other known examples of Gough's work. Close-up of the gold inlay "I.H.W" on the left grip. 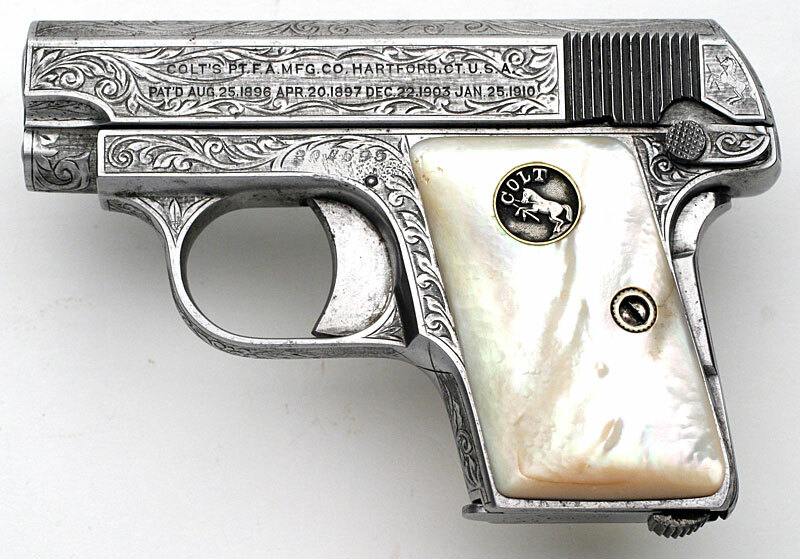 Factory Master Engraved and Silver Plated Colt Model 1908 Vest Pocket Model Serial Number 204695 - One of five guns shipped to William H. Gough on May 21, 1919, returned to Colt and reshipped to Murta Appleton on July 2, 1919. The engraving pattern on this pistol matches the pattern of 204423 (pictured above, which was also in the same shipment). 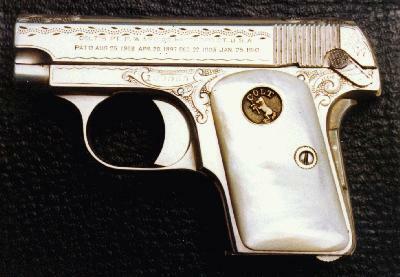 The other four pistols were also silver plated and fitted with mother of pearl grips. 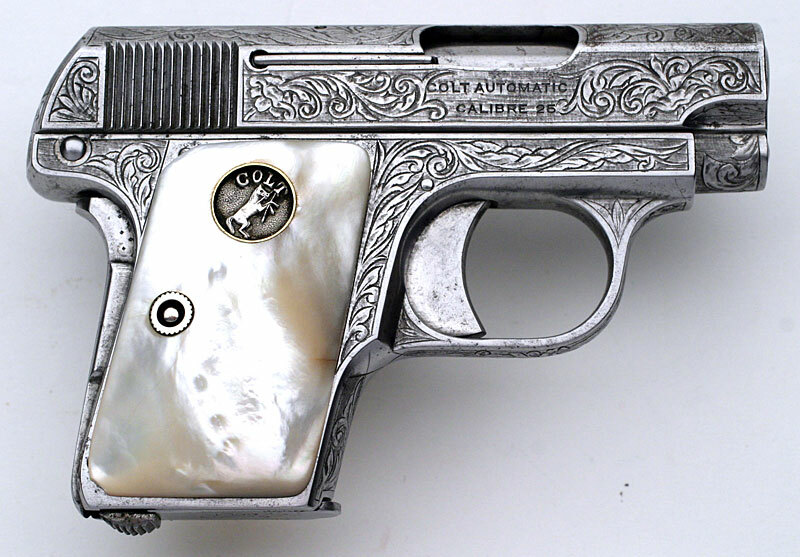 This pistol has full factory "C" coverage, is silver plated and is fitted with mother of pearl grips with recessed medallions. Colt Model N .25 ACP serial number 228236 Master engraved by William H. Gough - A very unique factory master engraved and silver plated Model N .25 ACP pistol engraved by Colt master engraver, William H. Gough. This pistol features complete engraving coverage and is fitted with Type III (square top, recessed medallion mother of pearl grips. This pistol was shipped on December 16, 1919 to Murta Appleton Co., Philadelphia, PA c/o W.H. Gough.